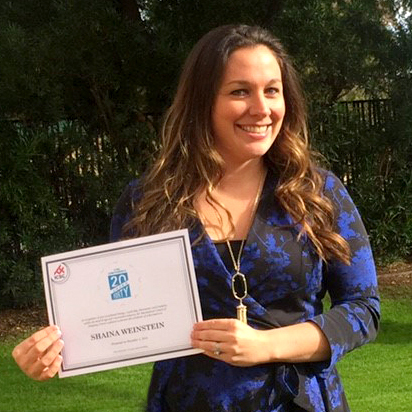 December 1, 2016 - At this year's 2016 CenterBuild conference, Green Building Initiative’s (GBI) Senior Director of Engagement Shaina Weinstein was honored by the International Council of Shopping Centers (ICSC) as one of the top emerging leaders in the architecture and design industry. Weinstein was recognized with the organization’s “20 Under Forty” award. ICSC’s annual international conference, CenterBuild, is a dynamic event dedicated to the issues of planning, development, design and construction of shopping centers and retail stores. The “20 Under Forty” award is given based on an individual’s energy, leadership, innovation and creativity. The award is given annually to twenty individuals who are nominated by their peers and it is given out during the ICSC’s annual CenterBuild conference. Weinstein has been with the GBI since 2014 and has demonstrated all the qualities that this award is meant to distinguish. “GBI sends Shaina sincere congratulations on this prestigious award,” said GBI’s Executive Director Vicki Worden. About the Green Building Initiative − The GBI is a nonprofit organization and American National Standards Institute (ANSI) Standards Developer dedicated to accelerating the adoption of green building best practices. Founded in 2004, the organization is the sole U.S. provider of the Green Globes® and federal Guiding Principles Compliance building certification programs. To learn more about opportunities to become involved in the GBI, contact info@thegbi.org or visit the GBI website, www.thegbi.org.